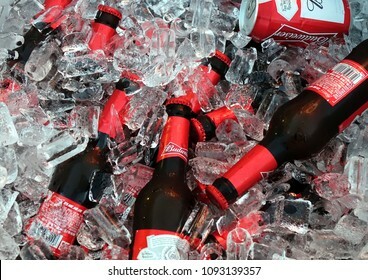 KAOHSIUNG, TAIWAN -- MARCH 2, 2018: An outdoor vendor sells Budweiser beer chilled in a bucket with lots of ice. 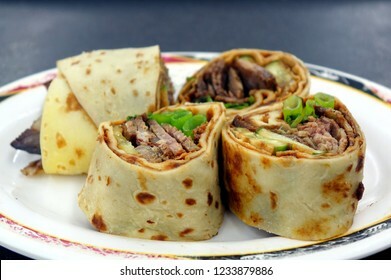 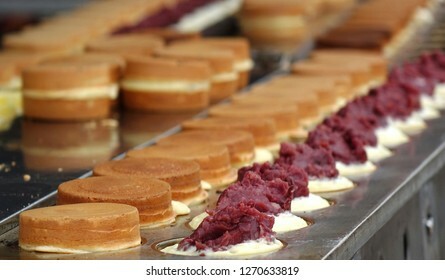 Red bean cakes, or Imagawayaki, as the Japanese call it, a popular sweet food in Taiwan. 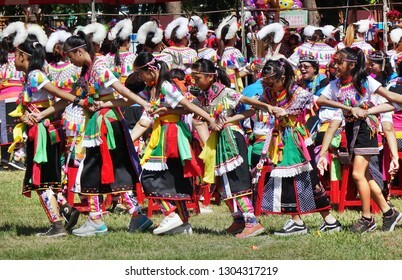 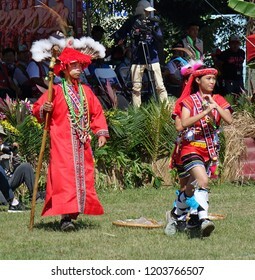 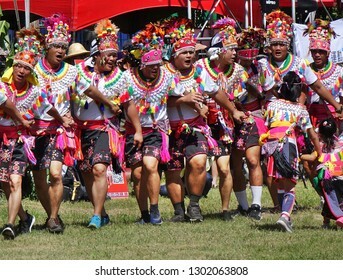 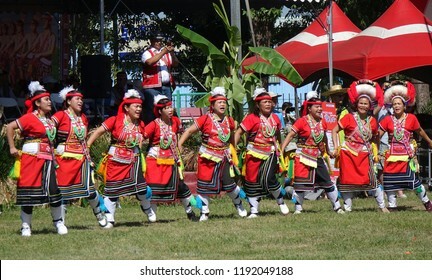 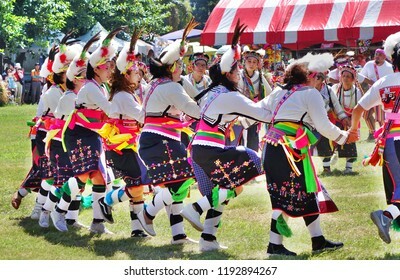 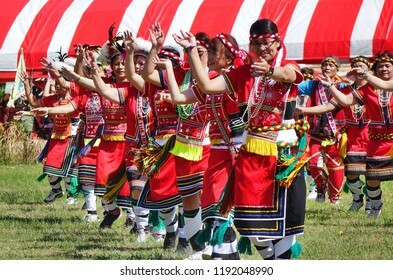 KAOHSIUNG, TAIWAN -- SEPTEMBER 29, 2018: Members of the indigenous Amis tribe in traditional costumes participate in the yearly harvest festival. 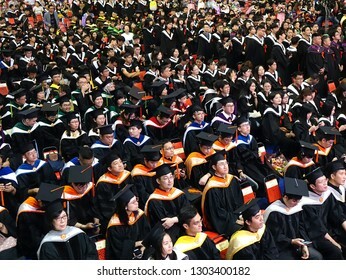 TAINAN, TAIWAN -- JUNE 2, 2018: Graduates listen to a speech at the annual graduation ceremony of NCKU university. 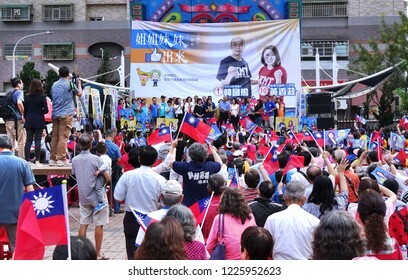 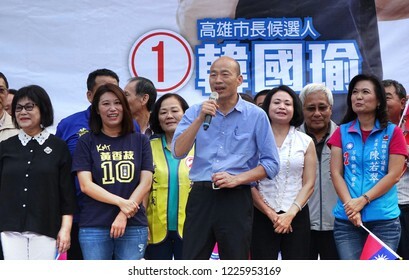 KAOHSIUNG, TAIWAN -- NOVEMBER 10, 2018: KMT Kaohsiung mayor candidate Han Guo-Yun (center, blue shirt), speaks at an election rally. 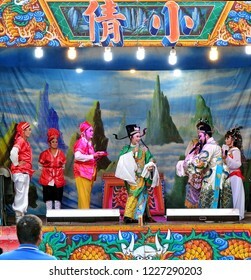 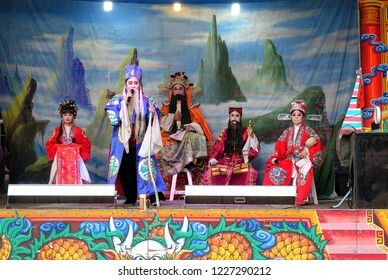 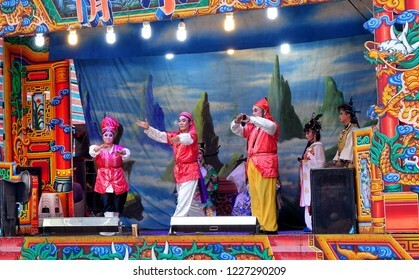 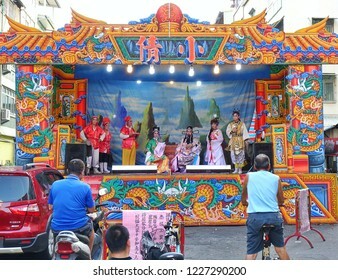 KAOHSIUNG, TAIWAN -- OCTOBER 26, 2018: Taiwan folk opera is performed in an outdoor public space as part of a temple celebration. 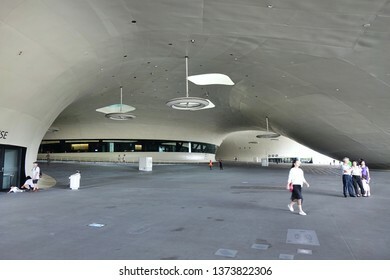 KAOHSIUNG, TAIWAN -- SEPTEMBER 13, 2018: The concourse of the Formosa Boulevard Station of the Kaohsiung MRT features a large public art glass installation. 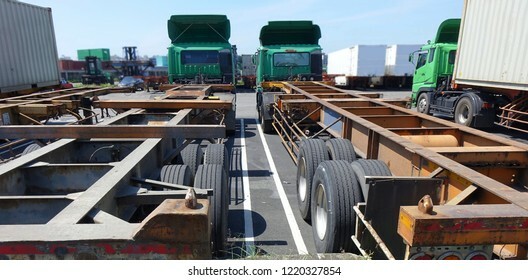 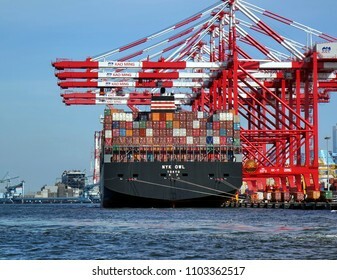 KAOHSIUNG, TAIWAN -- MAY 26, 2018: A large container ship is being loaded in the busy port of Kaohsiung, a major trading hub for Taiwan. 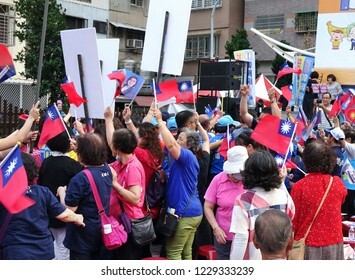 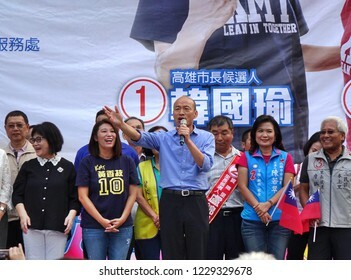 KAOHSIUNG, TAIWAN -- NOVEMBER 10, 2018: KMT Kaohsiung mayor candidate Han Kuo-Yun (center, blue shirt), speaks to supporters on his arrival at an election rally. 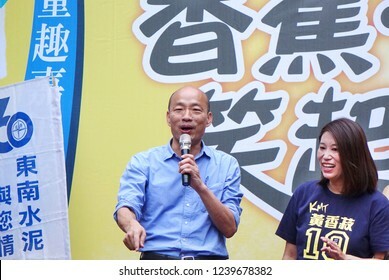 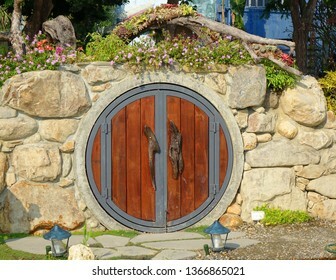 He won the election. 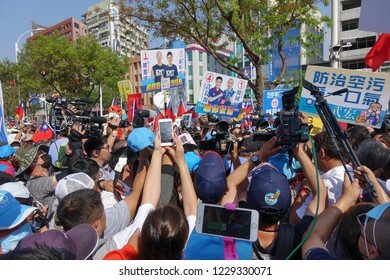 KAOHSIUNG, TAIWAN -- NOVEMBER 11, 2018: Supporters and media rush to greet KMT Kaohsiung mayor candidate Han Guo-Yun at an election event. 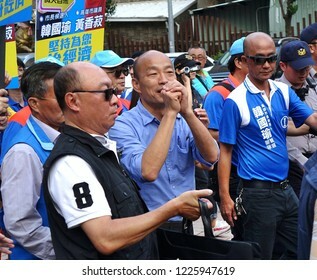 KAOHSIUNG, TAIWAN -- NOVEMBER 10, 2018: KMT Kaohsiung mayor candidate Han Guo-Yun (center, blue shirt), surrounded by security, greets supporters on his arrival at an election rally. 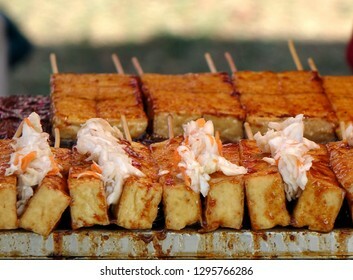 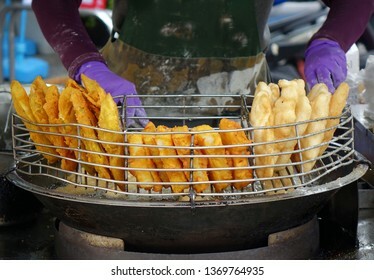 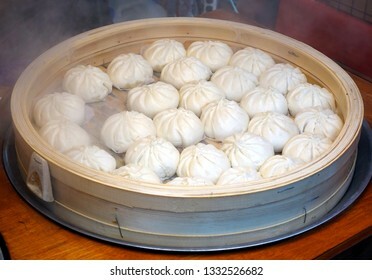 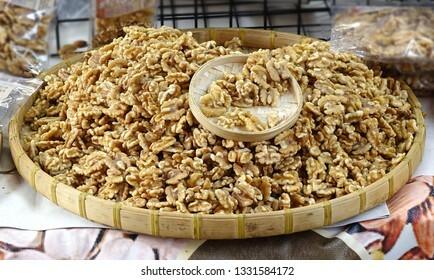 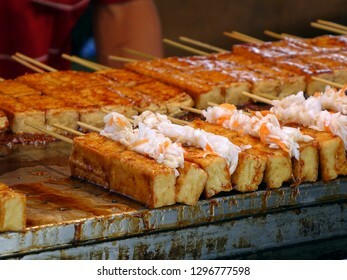 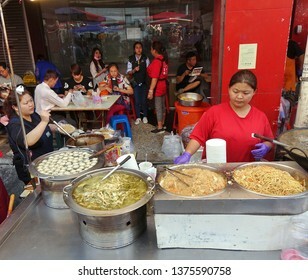 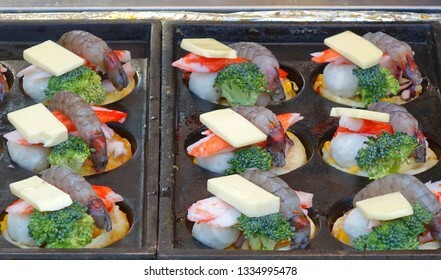 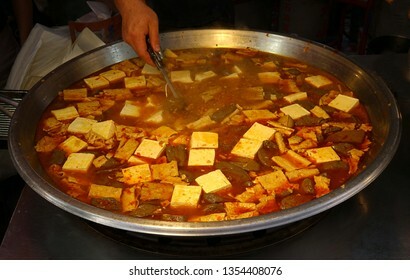 KAOHSIUNG, TAIWAN -- FEBRUARY 6, 2019: A street vendor cooks fried noodles, fish balls and pickled bamboo soup. 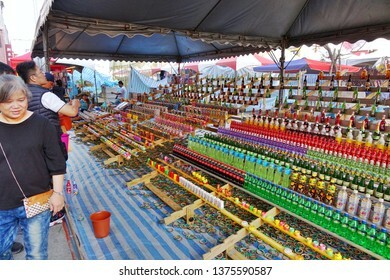 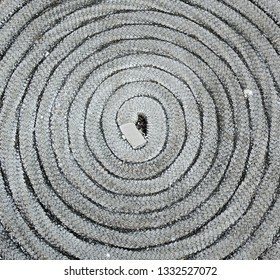 KAOHSIUNG, TAIWAN -- FEBRUARY 6, 2019: People try to throw bamboo rings over bottles in a skill game at a Chinese New Year Market. 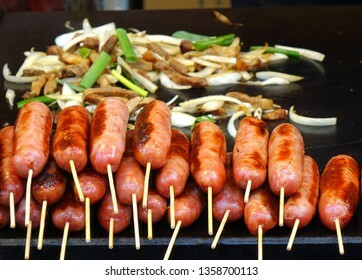 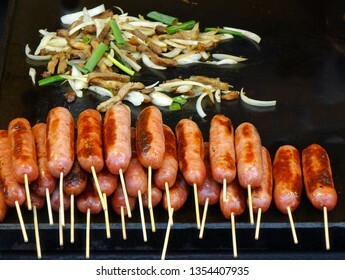 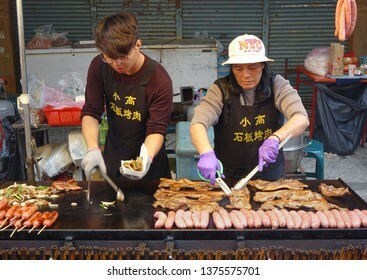 KAOHSIUNG, TAIWAN -- FEBRUARY 6, 2019: A street vendor cooks sausages, fried pork and onions in Teppanyaki style. 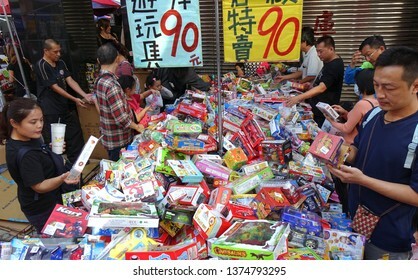 KAOHSIUNG, TAIWAN -- FEBRUARY 6, 2019: An outdoor market stall sells a big pile of cheap toys. 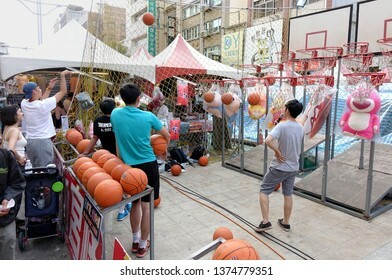 KAOHSIUNG, TAIWAN -- FEBRUARY 6, 2019: People try to score basketball hits in a skill game at a Chinese New Year Market. 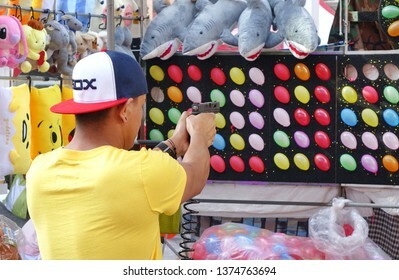 KAOHSIUNG, TAIWAN -- FEBRUARY 6, 2019: A young man uses a pistol to shoot at small balloons at a Chinese New Year Market. 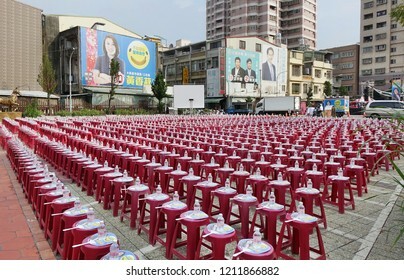 KAOHSIUNG, TAIWAN -- OCTOBER 19, 2018: Stools, water and fans are prepared for a rally for city council candidate Huang Xiangshu of the KMT in the run up for the November 24 elections. 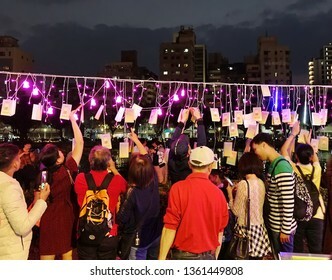 KAOHSIUNG, TAIWAN -- FEBRUARY 9, 2019: People hang up wish cards during the 2019 Lantern Festival on the banks of the Love River. 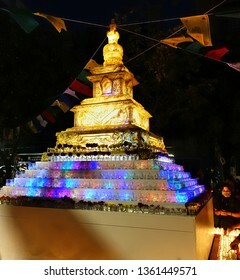 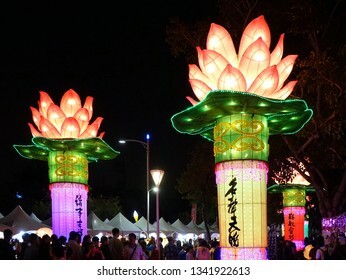 KAOHSIUNG, TAIWAN -- FEBRUARY 9, 2019: A large lantern in the shape of a Buddhist stupa is on display at the Lantern Festival. 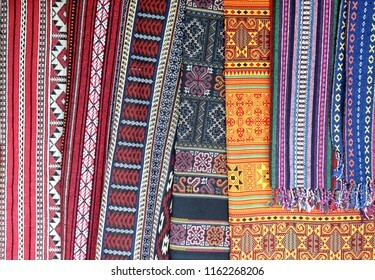 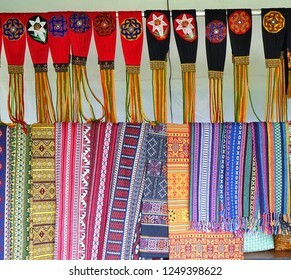 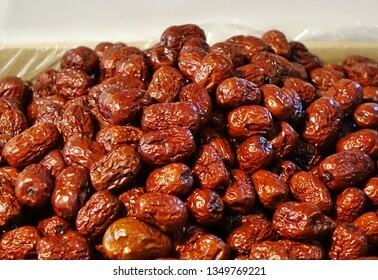 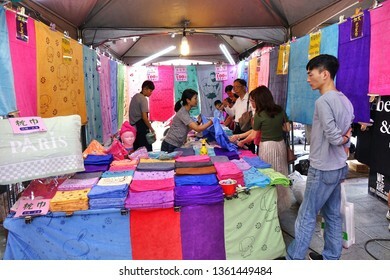 KAOHSIUNG, TAIWAN -- FEBRUARY 6, 2019: An outdoor market stall sells bath towels in various colors and sizes. 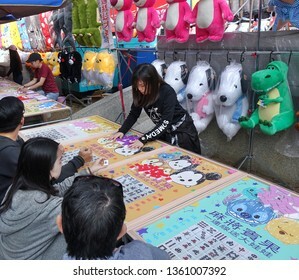 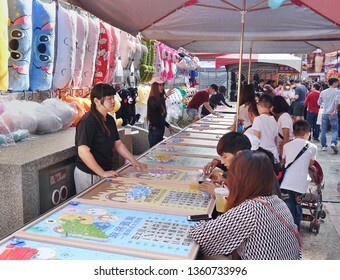 KAOHSIUNG, TAIWAN -- FEBRUARY 6, 2019: People play Bingo at an outdoor market hoping to win prizes such as stuffed animals and cartoon merchandise. 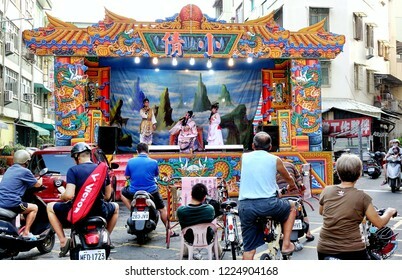 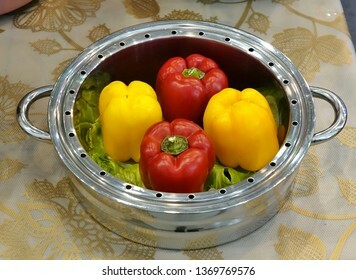 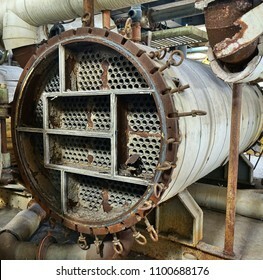 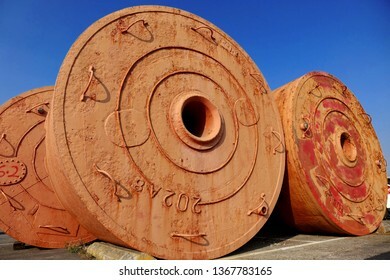 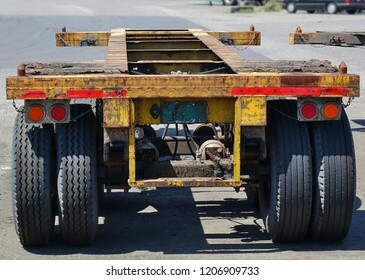 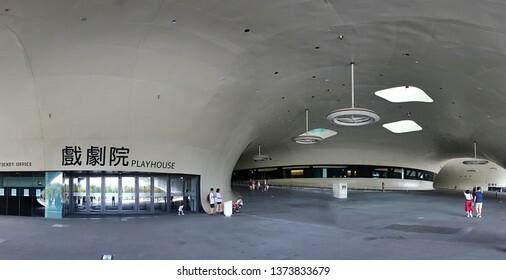 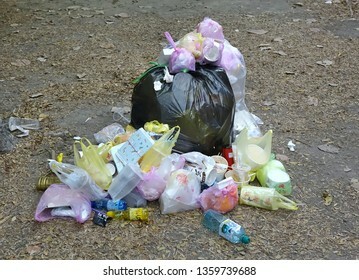 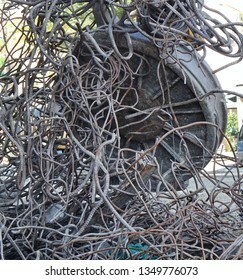 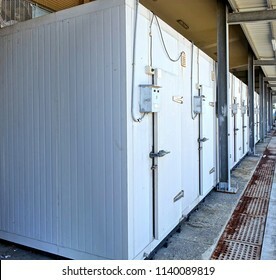 KAOHSIUNG, TAIWAN -- FEBRUARY 9, 2019: A lack of garbage disposal facilities at a public outdoor event results in severe littering and pollution. 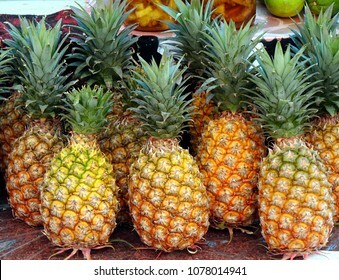 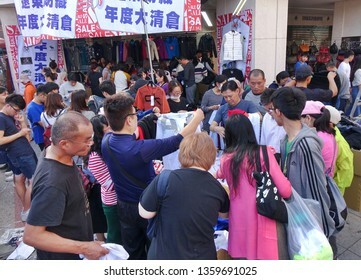 KAOHSIUNG, TAIWAN -- FEBRUARY 6, 2019: People snap up cheap shirts and clothing that is for sale at an outdoor market. 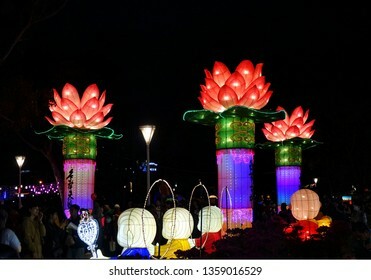 KAOHSIUNG, TAIWAN -- FEBRUARY 9, 2019: Large lanterns in the shape of the Buddhist symbol of the lotus flower are on display at the Lantern Festival. 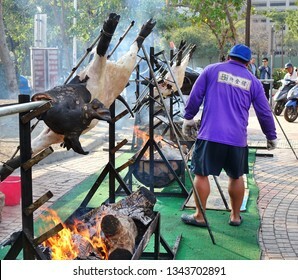 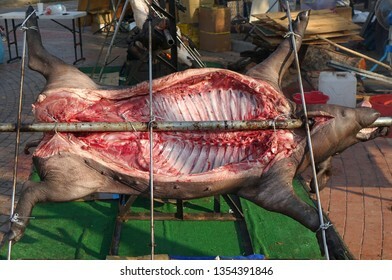 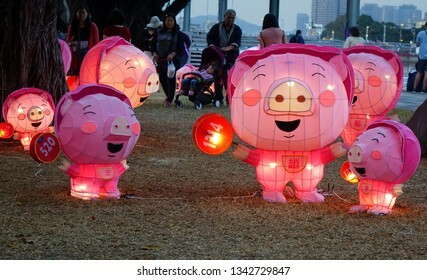 KAOHSIUNG, TAIWAN -- FEBRUARY 9, 2019: A member of Taiwan's indigenous people roasts whole pigs on the banks of the Love River during the Lantern Festival. 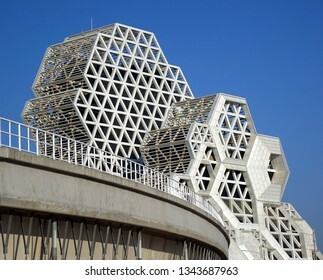 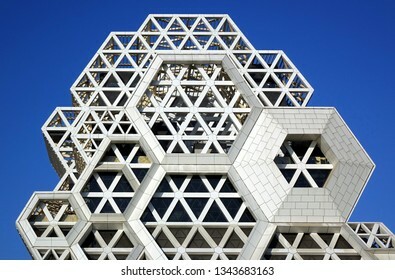 KAOHSIUNG, TAIWAN -- FEBRUARY 7, 2019: A close up view of the outer facade of the new pop music center which is nearing completion. 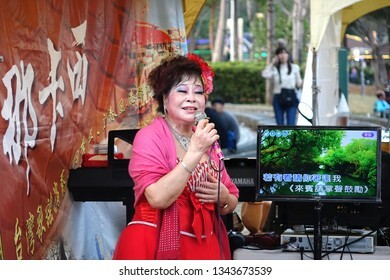 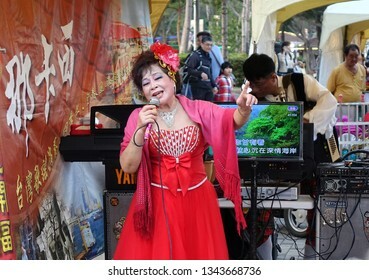 KAOHSIUNG, TAIWAN -- FEBRUARY 9, 2019: A female performer sings Karaoke songs on the banks of the Love River during the Lantern Festival. 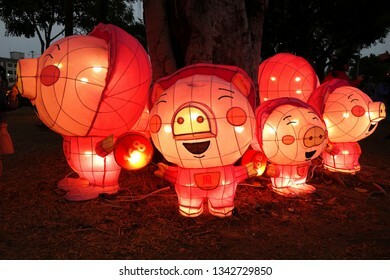 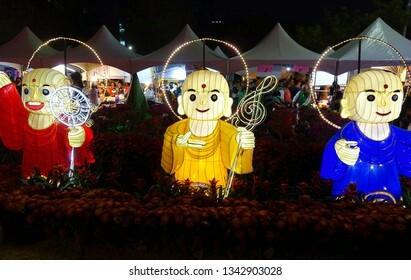 KAOHSIUNG, TAIWAN -- FEBRUARY 9, 2019: Three lanterns in the shape of Buddhist monks are on display at the Lantern Festival. 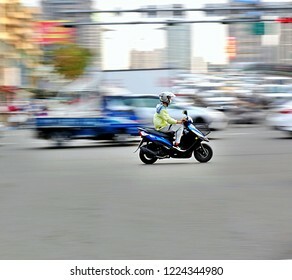 KAOHSIUNG, TAIWAN -- NOVEMBER 3, 2018: Taiwan boasts 15 million registered scooters, the highest motorcycle density in the world. 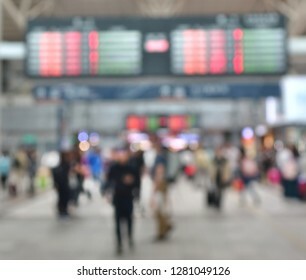 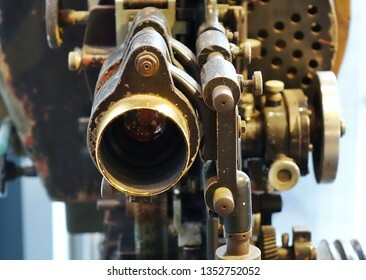 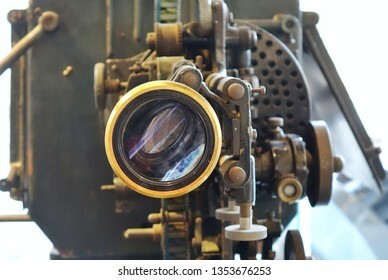 Image features motion blur. 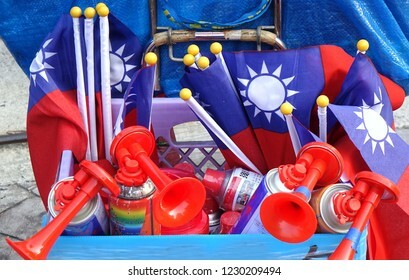 KAOHSIUNG, TAIWAN -- NOVEMBER 10, 2018: A vendor sells air horns and national flags at an election rally. 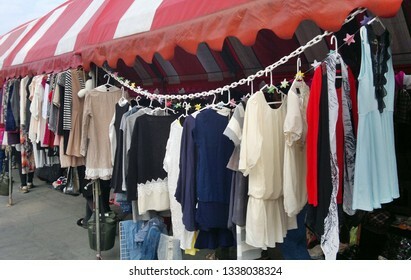 KAOHSIUNG, TAIWAN -- JANUARY 24, 2019: A display of dresses at an outdoor market for used clothing. 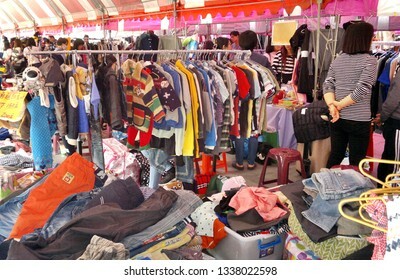 KAOHSIUNG, TAIWAN -- JANUARY 24, 2019: Shoppers and sellers at an outdoor market for used clothing. 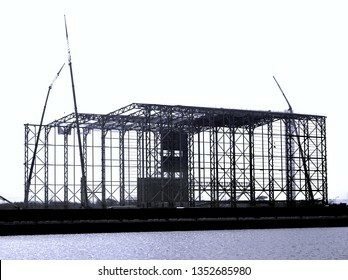 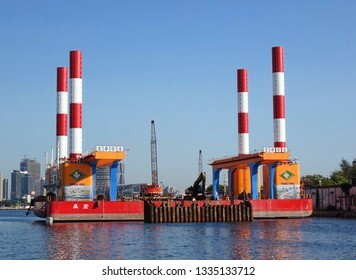 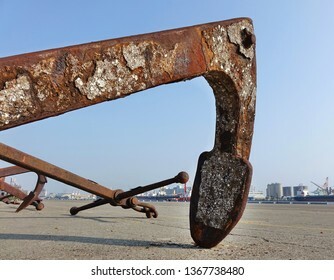 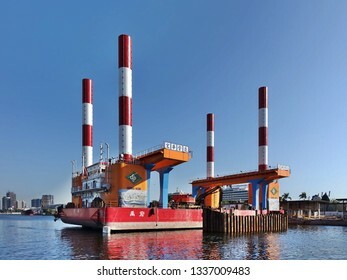 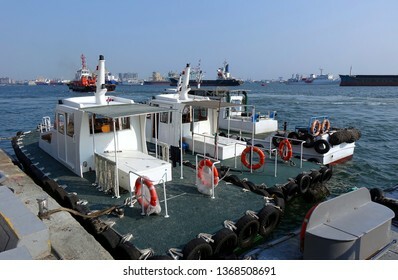 KAOHSIUNG, TAIWAN -- FEBRUARY 7, 2019: A floating dock construction rig is at work in Kaohsiung Harbor at a bridge building project. 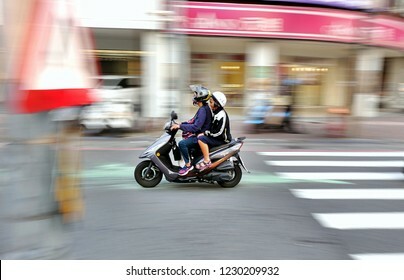 KAOHSIUNG, TAIWAN -- NOVEMBER 3, 2018: Taiwan boasts 15 million registered scooters, the highest motorcycle density in the world. 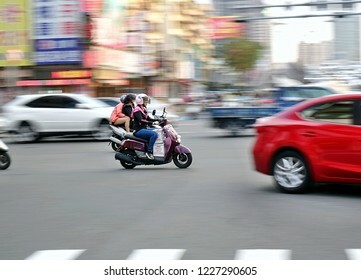 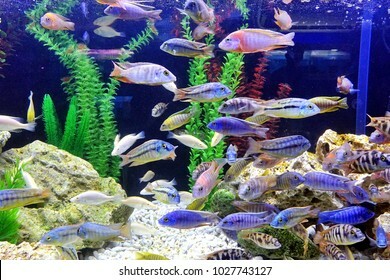 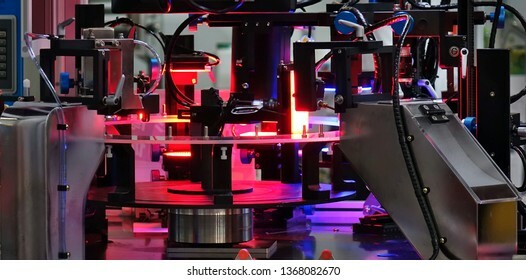 This image features motion blur to show movement and speed. 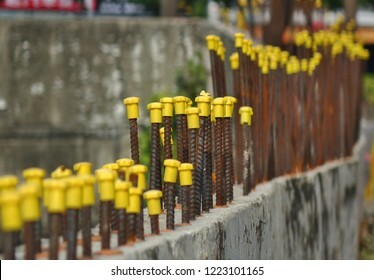 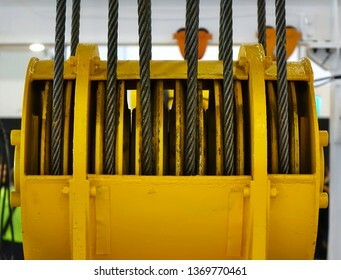 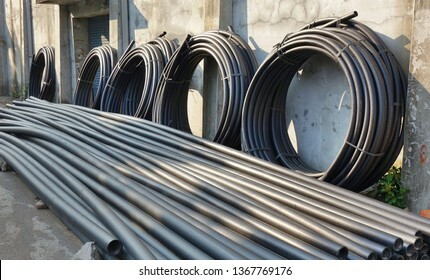 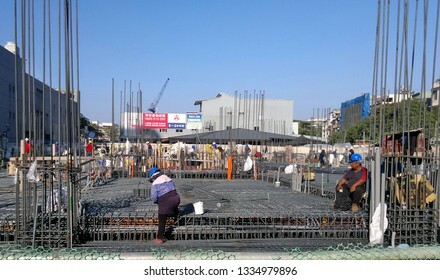 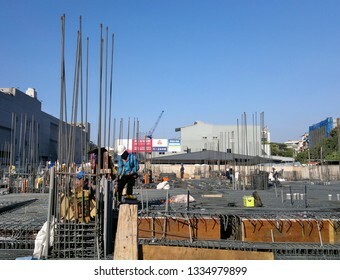 KAOHSIUNG, TAIWAN -- JANUARY 22, 2019: Workers at an apartment construction site prepare steel bars for reinforced concret application.